Websites will never change the world. Nothing beats the adrenalin created when we get together in person and conspire to organise for justice. Get in touch for a speaker or a training to deepening your learning. Along with many other incredible organisers, performers and artists involved in The Glass Is Half Full, I am available for talks, trainings and skill-shares. These can range from a 2 hour session to a month long in-depth programme. Prices range depending on the talk / training being requested and a sliding scale of price is offered to make the skills available to everyone. In the least five years we’ve helped organise and facilitate over 50 trainings, expanded on the speaker and training skills offered and generated a whopping list of resources [LINK] including some of our own films and handbooks. 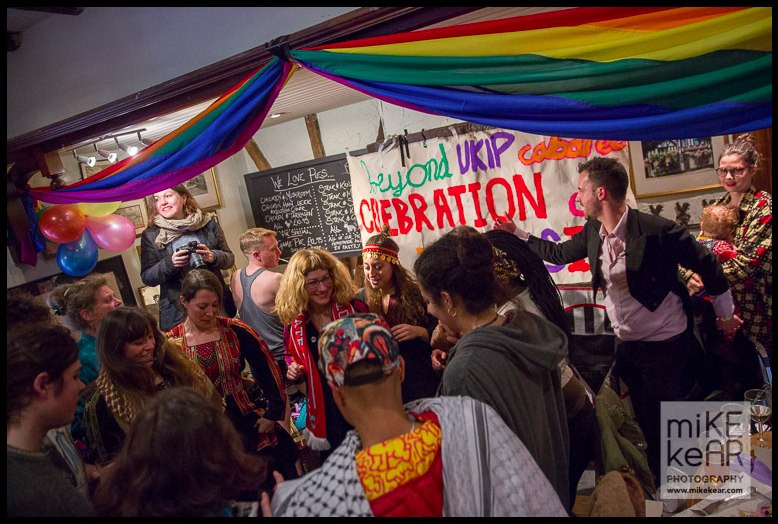 Some of the successes in the last five years include training HIV activists to shut down those perpetuating HIV stigma’s offices in London to creating a people’s cabaret in fascist political leaders pubs to training programmes in London ‘Strategies of Protest’ (George Padmore Institute, 2010); Manchester ‘The Art of Activism’ (Politika, 2014); Harare, Zimbabwe ‘People Power, activism and the imagination’ Headline at Shoko Festival (2013) to Harvard University (Massachusetts, USA – 2011) ‘Direct Action and New Tactics for Environmental and Social Justice’ – we’ve done a few barmitzvah’s along the way. For dan’s full CV click here. Our actions and programmes to make the world a more equal place deserve to get the attention they deserve! If we want to get our messages out to the right places and across a variety of media channels we need to meet our audience where they are at, capture the public imagination and enable the audience to capture clearly what our actions and demands want to express. We need to arm ourselves with a glorious toolkit of strategic creative tactics for social change if we need to challenge injustice in the way that it challenges us and the planet’s safety at large. We need effective, sharp and mass-empowering actions to create the change we need. Too often programmes for positive social change don’t reach their potential as we don’t create the necessary time for strategic planning. Supergluing Prime Ministers, playing golf on airport runways, cross-dressing gay rights catwalk shows, occupying Parliament roof-tops and confronting the military dressed as clowns is a whole lot of fun but also deadly serious. Disrupting the status quo with cheekiness, pranks and humour can do wonders to amplify programmes for social justice as well as to trick our targets out of power. Civil disobedience is the active refusal to obey certain laws, demands and commands of a government or of an occupying international power. Without civil disobedience the world would be a very different place. Women may not have the right to vote, we might be divided by our skin colour or the Nazi’s may still be in power. We need direct ways of regaining control of our lives and an ethic of direct action can be a part of this. Civil Disobedience isn’t just an action or intervening in the mechanisms of injustice, it’s a way of organising, of understanding and being in this world. Popular education is a process which aims to empower people who are marginalized socially and politically to take control of their own learning and to effect social change, build confidence, competence and commitment within and between individuals, groups, organisations and communities. Being Homo Sapiens, or “knowing humans”, humans have a biological instinct deeply rooted to the survival mechanism which keeps us interested in our self-interest. The essence of human nature is the minimizing of self-interest for the greater good: an expansion of empathy with others. While much can be done to expand the self and ultimately identify with the environment and the entire ecosphere some shadow of self interest will still remain, influencing the way we protect and perceive the environment. If we were to appreciate our unbreakable bonds to other humans and the entire natural world, we’d be more likely to act in ‘community defence’ when engaging in green activism. Community Defence is largely associated with social and environmental injustice meaning that everyone should have access to a safe, healthy environment, and to environmental resources. This can mean things often considered “environmental”, such as green spaces and clean air, but also other things such as healthy food and warm, secure housing. All environmental justice struggles are also about social justice. Part of fighting environmental injustice is therefore addressing the social injustices that mean that some groups are better able to protect themselves from environmental problems and have more access to environmental resources. Can community programmes for justice be transformative and empowering? How can those marginalised by society be afforded the luxury of archived, open and organised political activity? Empowerment is often known as the social processes’ that help people gain control over their lives and community for the greater common good. We should interact more with each other because we live side by side – only then will we foster empathy by learning more of each other and reduce the distrust between people. This way we get used to living with different people. In a world of hyper-mobility where the make of cities is becoming more diverse every day, a new and different type of ‘contract’ is needed to govern how individuals and groups behave together and see how interaction with the ‘other’ is the best way forward. Bored of unproductive, uninspiring and ineffective community meetings? Then check here. Standing on the shoulders of giants this talk / training explores how to inspiration from pioneering community empowerment methods such as Paolo Friere and Theatre of the Oppressed and others that reject the mainstream ‘banking’ education method (one person, usually a man, standing in front of the room ‘depositing’ his knowledge into students). These exercises in our toolbox are based in popular education, a concept grounded in notions of class consciousness, political struggle, and social transformation. The law is supposed to provide justice for the people – right? Well, if your busy organising programmes to create equality and peace in this world – don’t be scared if your actions end you up in court. For centuries people have utilised the theatre of the courtroom itself to create legal justice and create a splash in the news. How can we create provocative, flamboyant, glamorous, rowdy, insightful, moving, surprising and musical HIV responses to explore and expose the realities of HIV in today’s society? Can we create brilliantly in-your-face activism to stop the HIV ‘Second Silence’ to allow people affected and living with HIV to have a space where they can be themselves and have a voice about their health and lives? Whilst in many places HIV is now thankfully a more manageable condition – in 2015, infections in the UK are rising, stigma still exists and prevention services are inadequately supported – and even cut – in many parts of Europe. Not to mention other part of the world where HIV is still a death sentence.